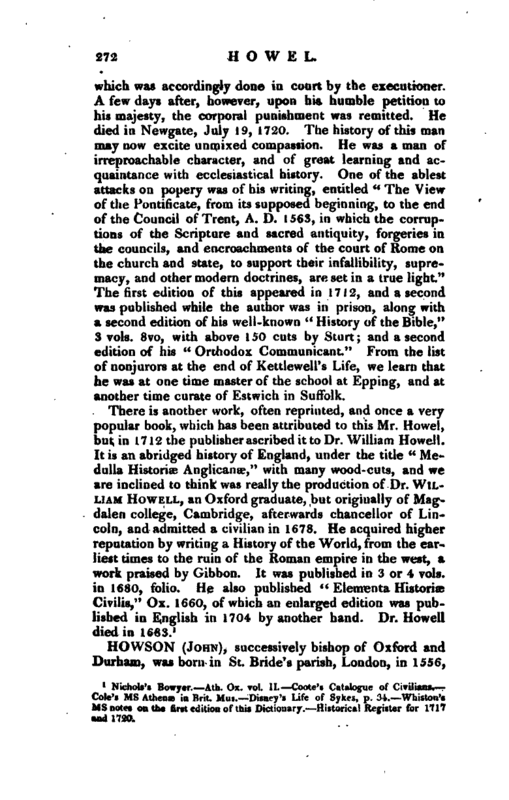 , a learned, but somewhat unfortunate divine, was born soon after the restoration, and educated at Jesus college, Cambridge, where he took his degree of B. A. in 1684, and that of M. A. in 1688, after which it is not improbable that he left the university, as he not only scrupled the oaths to the new government, but adhered to the nonjuring party with a degree of firmness, zeal, and rashness, which no considerations of personal loss or suffering could repress. In 1712 he was ordained and instituted into priest’s orders by Dr. Hickes, the celebrated nonjuror, who was titled Suffragan Bishop of Thetford. Before this, in 1708, he published “Synopsis Canonum S. S. Apostolorum, et conciliorum cecumenicorum et | provincialium, ab ecclesia Graeca receptorum,” 1710, in folio; “Synopsis canonum ecclesiae Latinae,” folio and in 1715, the third and last volume was announced “as once more finished” by Mr. Howel, the manuscript having been burnt at the fire whicb consumed Mr. Bowyer’s printing-house. Soon after this he printed a pamphlet entitled “The case of Schism in the Church of England truly stated,” which was intended to be dispersed or sold privately, there being no name of any author or printer. Both, however, were soon discovered, andRedmayne, the printer, was sentenced to pay a fine of 500l. to be imprisoned for five years, and to find security for his good behaviour for life. The principles laid down in Howel’s pamphlet are these: 1. “That the subjects of England could not transfer their allegiance from king James II. ; and thence it is concluded, that all who resisted king James, or have since complied with such as did, are excommunicated by the second canon: 2. That the catholic bishops cannot be deprived by a lay-power only; and thence it is inferred, that all who have joined with them that were put into the places of the deprived bishops, are schismatics.” As such assertions seemed to aim at the vitals of government, both civil and ecclesiastical, it was thought necessary to visit Mr. Howel’s crime with a more severe punishment than had been inflicted on. the printer. Accordingly he was indicted at the Old Bailey Feb. 18, 1717, fora misdemeanour, in publishing “a seditious libel, wherein are contained expressions denying his majesty’s title to the crown of this realm, and asserting the pretender’s right to the same &c. &c.” and being found guilty, he was ordered to pay a fine of 500l. to be imprisoned for three years, to find four securities of 500l. each, himself bound in 1000l. for his good behaviour during life, and to be twice whipped. On hearing this last part of the sentence, he asked, if they would whip a clergyman? and was answered by the court, that they paid no deference to his cloth, because he was a disgrace to it, and had no right to wear it that they did not look upon him as a clergyman in that he had produced no proof of his ordination, but from Dr. Hickes, under the denomination of the bishop of Thetford, which was illegal, and not according to the constitution of this kingdom, which knows no such bishop. 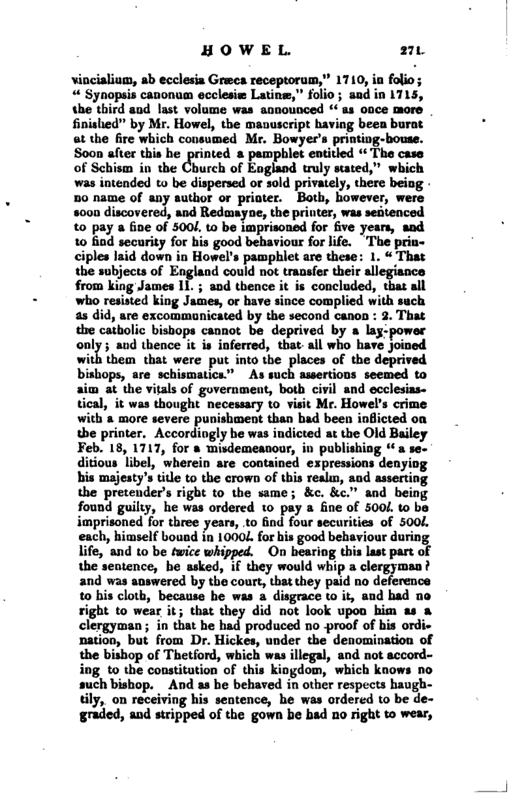 And as he behaved in other respects haughtily, on receiving his sentence, he was ordered to be degraded, and stripped of the gown he had no right to wear, | which was accordingly done in court by the executioner, A few days after, however, upon his humble petition to his majesty, the corporal punishment was remitted. He died in Newgate, July 19, 1720. The history of this man may now excite unmixed compassion. He was a man of irreproachable character, and of great learning and acquaintance with ecclesiastical history. 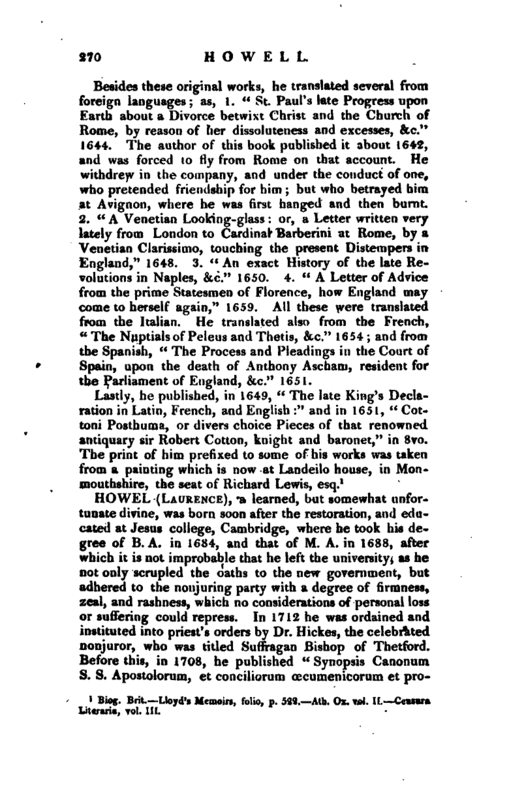 One of the ablest attacks on popery was of his writing, entitled “The View of the Pontificate, from its supposed beginning, to the end of the Council of Trent, A. D. 1563, in which the corruptions of the Scripture and sacred antiquity, forgeries in the councils, and encroachments of the court of Rome on the church and state, to support their infallibility, supremacy, and other modern doctrines, are set in a true light.” The first edition of this appeared in 1712, and a second was published while the author was in prison, along with a second edition of his well-known “History of the Bible,” 3 vols. 8vo, with above 150 cuts by Sturt; and a second edition of his “Orthodox Communicant.” From the list of nonjurors at the end of Kettlevvell’s Life, we learn that he was at one time master of the school at Epping, and at another time curate of Estwich in Suffolk. Nichols’s Bowyer. —Ath. Ox. vol. II. Coote’s Catalogue of Civilians. Cole’s ms Athena; in Brit. Mus. Disney’s Life of Sykes, p. 34. Whiston’s ms notes on the first edition of this Dictionary. Historical Register for 1717 and 1720.